Savannah, aka: Sailor Crafty, is a very talented cosplayer. Her works include Sora from Kingdom Hearts, Sailor Moon, and Lugia the Pokemon. 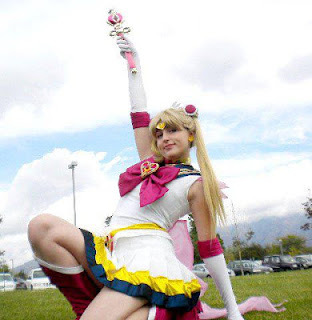 Sailor Crafty has a very wide range of skills and great advice for young up and coming cosplayers. 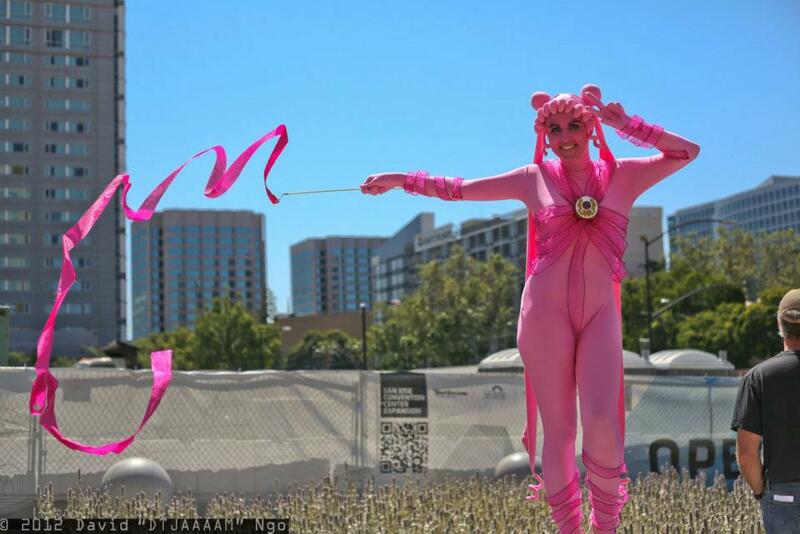 She defines cosplay as "Disneyland for nerds, where everyone can dress up!" Please welcome SailorCrafty as February's Cosplayer Feature. Sailor Crafty as Sailor Moon from the Sailor Moon series. I first ran into Savannah a few years back at GEEX (Gaming and Electronics Expo in Utah.) 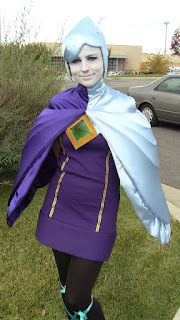 Ever since then she has never ceased to amaze and step up her skill with each cosplay. She has a wide range of skills from sewing to creature construction. She is also a wonderful teacher. Savannah has a blog where she will update how to make certain cosplays. Her Youtube channel also has many fun tutorials. Because of Savannah's willingness to share and talk about cosplays, next week she will be the first to be on the "How They Made.." section of this blog. 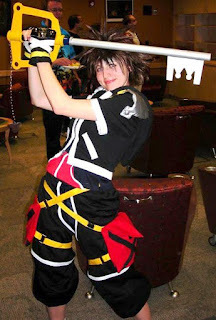 She will be talking about how she made her Sora cosplay and the time she put into it. Sora from Kingdom Hearts II. Next week we will delve into the creation of this cosplay! How long have you been cosplaying and what got you started? Nine years...wow has it really been that long? After I graduated from high school, my friend let me know about a monthly cosplay/anime night at our local comic book store. He liked Naruto and suggested Ino as my first cosplay since it was relatively easy to put together. I made it with athletic tape and an old dress that I cut up and re-arranged. I discovered how much fun it was to dress up with other people and how open and nice the other cosplayers were. I was kind of thrust into this community where everything was lollipops and rainbows. It is like Disney Land for nerds, where everyone can dress up! Why the name Sailor Crafty? Sailor Moon introduced me to Japanese anime and it is close to my heart. Crafty made sense because I wasn't just a costumer but I also made other things like pillows and cookie cutters. I like all things crafty. What awards have you won and what events have your cosplays been featured? I've won some very small awards in things like work and church Halloween contests, where I was the only "cosplayer" and so had put a lot more time into my costumes, haha. The only convention award I can think of was from GEEX. My Pokemon group got a Judges' Choice award for how clean our costumes looked and for how excited the crowd was. We had a Charmander, Lugia, Ash and Lyra and we were a big hit! I've been on stage with Lugia for the Matsuri festival in SLC and at Anime Salt Lake also so he is well known. Other than that I haven't made anything else that I felt confident enough to compete on stage with yet. I hope to change that in the upcoming years! My skills are still developing as I learn new things. Sailor Crafty is the trainer and her husband was Lugia. 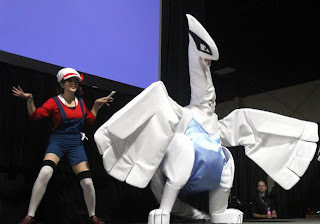 Fun fact: Lugia's structure is made mostly out of Astro Foam! There is some aluminium screen mesh to help hold the shape. What would you define as your crafting specialty? What would be your advice to a starting cosplayer who wants to make big creature cosplays? Really think about your comfort level while in the costume. How much weight can you carry? Is the fabric for the "skin" breathable and will you need fans to keep cool? Will you need to use your arms/hands/talk while in the costume? How easy is it to take off if you had to say...go to the bathroom? Even the most complex looking creature can be broken down into simple shapes that can be attached together to make your life as easy as possible. That also helps in getting the outfit to and from the convention in your vehicle. Try buying cardstock and playing around with it. You can start on a small scale and work your way up. It is great for patterning and figuring out the shapes for your creature. Fun Fact: The big jewel was Sailor Crafty's first time resin casting experience. She used food coloring for the dye but it left tiny dark spots in the cast. Every cosplay has something new learned! Let's see, the big resin jewel was my first resin casting experience. I made the mold from cut up pieces of a plastic bucket that Model Magic came in. Also I used food coloring for dye but it left tiny dark spots in the cast so I don't recommend using that, haha. I think that initial roar from the crowd at GEEX when Lugia and Charmander got on stage was really memorable and rewarding. Also just walking around the con and getting pictures with kids who love the characters. Kids have the best reactions to big cosplays because their imaginations are still so free and it makes them feel like life really can be magical. I've been watching videos from stanwinstonschool.com to learn about how the movie effects industry does creature design. These are the guys that work on Aliens and Jurassic Park (favorite movie ever!) so I really look up to them. I'm hoping to learn some really awesome methods for my future cosplays. Some future outfits I hope to do include a Velociraptor, Draco from DragonHeart, Bahamut from Final Fantasy X, and a Tachikoma from Ghost in the Shell. I've discovered a great inexpensive material called Astrofoam that is lightweight, easy to work with and holds its shape so I know all these creatures are within my reach and budget. I can't wait to hear crowd reactions for these creatures when they first step onto the stage someday! This cosplay has some of the best reactions from those who know what this cosplay is.